To move loads, forklift trucks insert the prongs underneath the pallet, which is then raised above the ground by a mast. Forklift Trucks – Wiggins Lift Co., Inc.
Forklift trucks are small industrial vehicles used in the lifting, moving and transferring of loads in material handling applications for warehouses, manufacturing facilities and construction locations. With a pronged attachment jutting out of the front or side of the vehicle to hold the load, forklifts can be used in a wide variety of functions and are critical elements of many industrial spaces and distribution centers. As the loads moved by these industrial trucks are often in excess of thousands of pounds, it is imperative that these machines be designed to accommodate efficient and safe handling according to their lift capacity and reach. 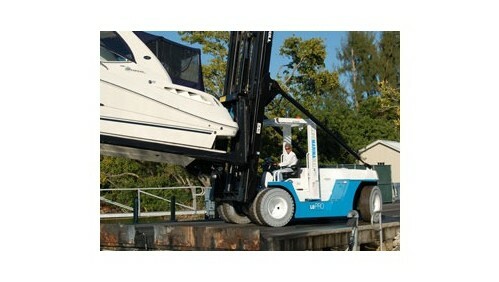 To move a load, the forklift truck inserts the prongs under the pallet which is then raised to the desired height. As loads requiring to be moved are often heavy, most forklifts are counterbalanced with a weight in order to prevent the vehicle from overturning as the load is raised. Forklift trucks are powered electrically, hydraulically or with internal combustion motors. Electric forklifts are becoming increasingly popular due to increased emphasis on minimizing fuel transmissions in the air of the working environment. They are configured for both indoor and outdoor applications and come with either pneumatic or solid tires. As the spaces in which forklift trucks are used are often small and constricted, precise maneuvering of the vehicles and loads is imperative in order to prevent both material and vehicular damage. Often guide rails are inserted into the flooring of the aisles to lead the truck down a consistent and straight line. In other cases marking systems or laser guiding may be used. It is important that the operators of forklift trucks be well trained in order to most safely operate the vehicles. Other safety features may include hand rails, bumper rails or an overhead cage of sorts to prevent damage from falling objects. The masts, or lifting systems of forklifts are most often hydraulically or pneumatically powered, with the ability to reach many feet into the air. This is convenient for space conservation purposes as manufacturers are able to stock their goods and materials as high as the ceilings in their facilities, making the most of the available floor space. Narrow forklift trucks are a popular choice of vehicle as they are able to efficiently operate in much narrower aisles than regular forklift trucks, thus allowing the shelves to be closer together within a space, and creating more room. Forklift Trucks Forklift trucks are small vehicles used to lift and move large loads with a pronged attachment jutting out of the front or side. They are widely used in warehouses, construction sites and manufacturing facilities for loading, storage and transportation applications.